Want Moms and Dads to check out your fabulously chic, yet irresistibly practical product? 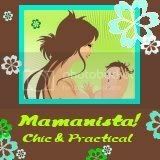 We review products on Mamanista! when we have had an opportunity to see the quality first hand. If you have something that Mommas Gotta Have, we'd love to check it out! We review essential items for moms, babies, and children; luxurious spoil-yourself treats; and unique products. Maternity products and most products for babies under 1 will be reviewed at this time by Mama-To-Be. Products for babies 1 year and older will be reviewed by Mama Luxe and Baby Diva. Fun products for Mamas will be reviewed by whichever one of us can hit reply fastest. Please contact us (mamanista@gmail.com) to receive the correct address for sending sample products for review. Due to the volume of requests, we cannot guarantee reviews and are unable to return sample products. If we choose to feature your product, we will let you know and send you a button you can post to let everyone know you've been featured on Mamanista! Any coupon codes you would like to offer our readers--our readers enjoy saving money and we find this generates more interest! If you would like to guarantee that you are seen in fabulously chic company on our sidebar, we encourage you to take out an advertisement and consider sponsoring a contest.